→ After you read this post, be sure to request your photo gift at the end of this post: our downloadable Guide to Getting Stunning Website Photos. The images on your website can be powerful enough to both tell a story AND evoke a parent’s emotion. Parents want to give their child a happy, healthy childhood experience. They want their child to feel confident and secure, to explore their creativity, to have strong independent thinking skills, and to be able to express themselves in a way that feels safe. Music lessons can give children every one of those things - as you and I already know. When your website shows children who are smiling and laughing as they express themselves through music, it evokes feelings of confidence in parents that this will be a profoundly positive experience for their child. You don’t have to tell parents that your students love playing music; they can see it for themselves. Music Speaks Studio in San Diego, CA. Photo by Fidel Cante. While it’s easy for us to hide on this side of the camera, it’s a great idea to occasionally be part of the photos on your website. Allowing parents to see you engaging with your students, affirming their efforts and sharing in their excitement, you immediately begin to build trust. Another great place to allow parents to begin to get to know and trust you is through your bio. A current headshot should appear with your bio, so they are able to put a face with your story. Because most of us do work primarily with children, it’s vital that we take trust-building seriously. Allowing parents to see you before they meet you will help them to picture you teaching their child. Chances are good that you’ve already visited the websites of a few other studios in your area, but go ahead and take another look. Visit the top 3 - 5 studios that come up in your search results for lessons in your city. What you see is what parents are seeing. What another studio offers is not what you are offering. What do you have to offer families in your town that no other studio is offering? Is it the Simply Music program? 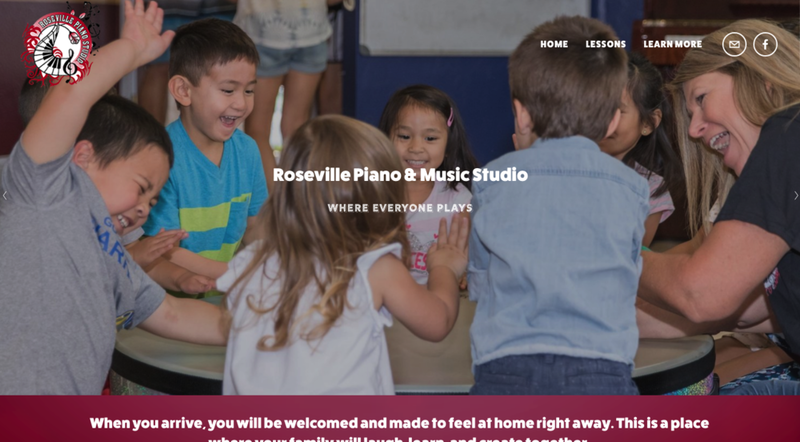 Group piano lessons? Your tech-savvy music lab or your adult singing club? That’s what your website photos need to show. When a parent arrives at your website, they need to see the experience in your studio that will change their (or their child’s) life. That’s the parent you’ll immediately connect with - and will hear from. Want to know exactly how to get the very best photos for your website? We’ve put together an easy, step-by-step guide to getting fantastic studio photos for your website. It will help you tell a powerful story through your website photos, and it’s absolutely free. Here’s your Guide to Stunning Website Photos. Thanks for reading this post, and happy photo-gathering!